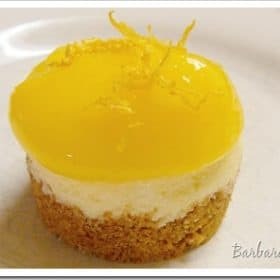 Instead of cake for his birthday, my husband asked me to make him a cheesecake with a tart lemon topping similar to the Lemon Cream Cheese pie they serve at Marie Callender’s. My wonderful son gave me a mini cheesecake pan for Christmas, so this was the perfect opportunity to give it it’s maiden voyage. Jenny at Picky Palate is always creating fabulous desserts with her mini cheesecake pan. So I adapted her Shortbread Cookie Crusted Peanut Butter Mini Cheesecakes with Chocolate Ganache to create luscious lemon mini birthday cheesecakes. These little beauties were a wonderful combination of sweet and tart, creamy and crunchy. I bet you can’t eat just one! Preheat oven to 300º. In a medium bowl, combined graham cracker crumbs and melted butter. Spoon a heaping Tablespoon of crust into each mini cheesecake pan or mini muffin tin. With fingers or round end of a wooden spoon, press crust down evenly. Fill each crust filled cup ¾ way full of cheesecake batter. Bake for 18-20 minutes or until cheesecake is set. Remove from oven and let sit in pan at room temperature for 30 minutes before removing. Transfer mini cheesecakes to a cooling rack to cool completely, another 30 minutes or so. Refrigerate until serving. To serve spoon lemon curd over each cheesecake. Transfer mixture to a medium bowl. Lay a sheet of plastic wrap directly on the surface of the curd to avoid a skin from forming; wrap tightly. Let cool; refrigerate until firm and chilled, at least 1 hour. Store, refrigerated in an airtight container, up to 2 days. If you want to bake a bigger version of this cheesecake in a springform pan, I loved Abbey’s Infamous Cheesecake I made last year for the Daring Bakers challenge and then top it with the lemon curd recipe. It's so cute! I love all things mini. Oh, this looks divine. Love lemon and mixed in with cheese cake it has to be very fine. I'm sure it was a great birthday cake. These are so pretty!! My husband loves cheesecake too. He would be thrilled I made this! I have been wanting to try making lemon curd. Tes gâteaux sont une merveille pour les yeux. Très beaux et certainement très bons. What gorgeous little cheesecakes. My 2 favorite things…cheescake and lemon. I've never seen the small pans. I'll have to take a look at them. I love cheesecake but don't make it enough. You have inspired me! I am so in need of my cheesecake fix right now after looking at this photo! I love the bright color of the lemon curd! What a burst of sunshine for these drab winter days we're having here in Indiana. Great looking dessert Barbara! This reminds me so much of my favorite lemon cheese cake. Lemon curd on top of cheese cake … is simply irresistable.. I've an award waiting for you at my blog. Thank you for sharing the recipe. I have to try them in the mini size, they look so good. I love non-traditional birthday treats! This looks incredible…if (and when) I make this, I will be making extra lemon curd since I could eat it with just about anything! I love them! I would totally want them for my birthday over cake too. Yum! I love lemon curd! Gorgeous! I love lemon and I love mini dessert, so I guess I'll be making these. OOoooh,…Aaaaaah,…MMMMMMM,….what a feast for the eyes & mouth!! A georgous & very tasty dessert! These are beautiful! I want to make these!! !